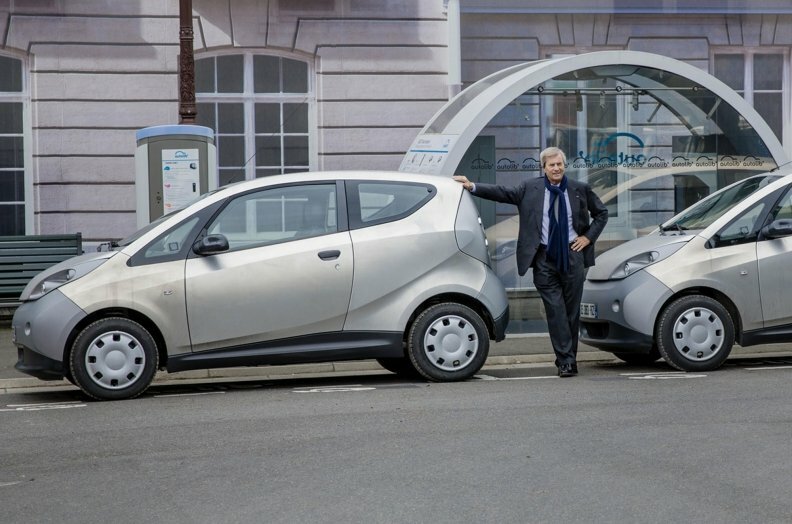 Vincent Bollore, billionaire and chairman of the Bollore Group, poses for a photo with an Autolib electric Bluecar at the Autolib car-sharing headquarters in Vaucresson, France. Bollore is targeting Los Angeles and Singapore as the next markets for his electric-car sharing service after its debuts later this year in London and Indianapolis. PARIS (Bloomberg) -- The Tesla Model S, a sumptuous, four-door electric sedan with a sticker price of $71,000, has a waiting list that stretches to months. Vincent Bollore can get you behind the wheel of an electric with “far superior” technology this afternoon. For just 20 cents a minute. Bollore, the French billionaire who is the biggest shareholder of Vivendi, has created Autolib, a car-sharing service in France stocked with hatchbacks called Bluecars. The result is something of an anti-Tesla: bug-like, no-frills electrics rented by the minute, with no big upfront investment for drivers. Tesla Motors Inc., by contrast, is following in the tire tracks of the traditional auto-industry, making vehicles and selling them to individuals. Aside from bottom-up approach to emission-free transport, the technology that powers the cars through Paris traffic is different. Bollore insists his batteries are more durable and safer -- and that they represent the best path to profit. “The key element in an electric vehicle isn’t the vehicle, it’s the electrical systems,” said Bollore, 62, who turned his family’s 193-year-old paper-making operation into an $11 billion conglomerate called Groupe Bollore, with stakes in dozens of businesses ranging from shipping to palm oil. “We think that our technology is far superior” to Tesla’s. 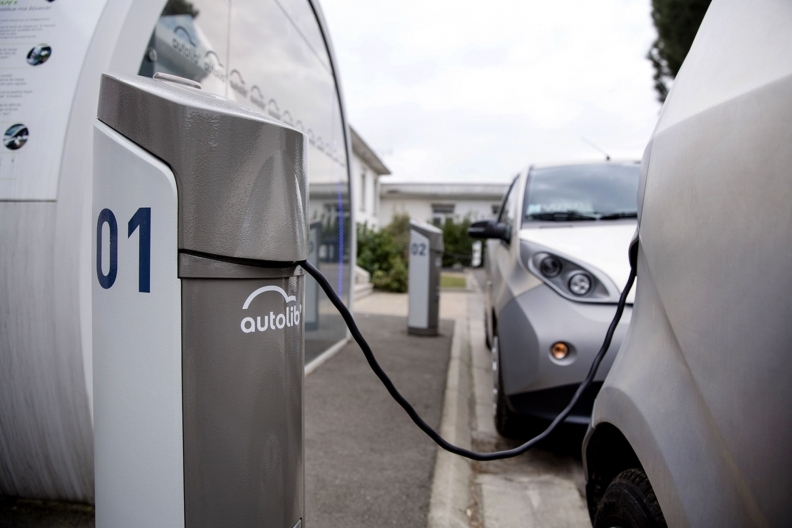 After spending three years and 3 billion euros ($3.2 billion) developing the cars and batteries used in Paris (as well as Lyon and Bordeaux), Bollore is preparing to take the idea global. First stop: Indianapolis in June, then London later this year. He says he has also applied for a permit in Singapore and is eyeing Los Angeles. Bollore: “We think that our technology is far superior” to Tesla's. Autolib, modeled after the French capital’s Velib bike-sharing program, is the best way to overcome consumer resistance to electrics, Bollore says. City-dwellers can use the cars for shopping, hauling kids, or weekend jaunts to the countryside without worrying about where to plug in at night. The Bluecar is a long way from the sleek luxury of a Model S. Those made for Autolib are a single color -- metallic gray -- and adorned with ads for the service in red and blue letters. Autolib has about 3,000 Bluecars and 900 stations in and around Paris, with 500 more cars and 200 stations expected this year. Roughly 70,000 people have paid 120 euros for a year’s access to the cars, which then cost them 18 euro cents per minute to drive. 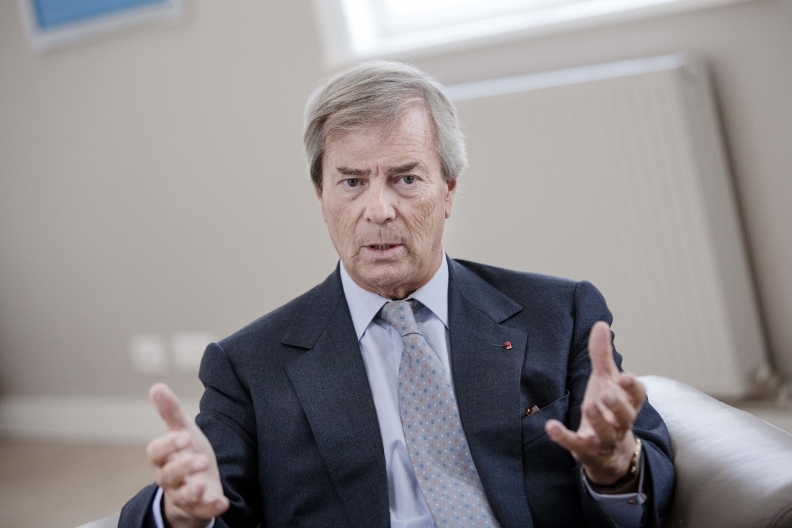 Bollore says the Parisian operation can break even with about 10,000 more subscribers. Occasional users can also pay 9 euros per half-hour for one-off rides. The cars were designed and built by Pininfarina SpA, the Italian auto designer and contract manufacturer. In June, France’s Renault SA will start making them in the English Channel port city of Dieppe. Bollore has sold about 450 of the $20,000 cars to consumers and companies. Last year, Bluecar introduced a convertible called Bluesummer and a commercial variant with a cargo area instead of rear seats. Bollore says he chose Indianapolis for Bluecar’s first foray into the U.S. because of the city’s strong automotive culture -- think Indy 500 -- and the Midwest’s extremes of winter cold and summer heat, which will test the vehicles’ durability. By year-end, he expects to have 500 Blueindy cars and 200 charging stations across the sprawling city. “Indianapolis shouldn’t be more complicated than Paris,” Bollore said at his grandparents’ manor house in suburban Paris, which serves as the headquarters of Blue Solutions SA, the company that oversees the effort. Blue Solutions, which went public in 2013, developed its batteries using a technology called lithium metal polymer. Unlike Tesla’s lithium ion batteries, they don’t need liquid electrolytes to store electricity, which makes them lighter -- important in electric cars, where the battery can account for more than a quarter of the weight. An Autolib electric car sits at a charging station at the Autolib car-sharing headquarters in Vaucresson. Bollore says his batteries remain stable at temperatures as high as 170 degrees Celsius, while lithium ion has a greater fire risk. And he says his batteries can be recharged 3,000 times, at least triple the life of lithium ion. Tesla declined to comment. To date, no car company has adopted Bollore’s technology. And the number of times car batteries can be recharged is of little importance because they’re not hard to replace and prices are likely to fall, said Andrew Lee, an auto consultant at Frost & Sullivan Inc.
“The number of cycles isn’t that relevant for automotive applications,” Lee said. A factory Tesla is building in the Nevada desert is poised to change the math in its favor. The company says the $5 billion facility will open next year and produce a half million batteries annually by 2020. Blue Solutions expects to make about 5,000 batteries a year by 2017. Tesla predicts its plant will help cut the price of lithium ion batteries by at least 30 percent. Lee says the figure is closer to two-thirds, a huge advantage, since batteries represent about half of the cost of electrics. Bollore is the first to admit there’s no assurance he’ll be successful. With automakers and tech companies worldwide working on electrics, he faces intense competition on all fronts. Yet he says that given the extent of his other holdings -- Bollore is worth $6.2 billion, according to the Bloomberg Billionaires Index -- it’s a bet he’s willing to make. Blue Solutions posted a net loss of 4.9 million euros in the first half of 2014 on revenue of 46 million euros, and its shares have fallen 30 percent since July. The company will issue financial results on March 19.